------The geologic map of British Columbia looks like someone spilled colors off a palette. Each color band, indicating a different association of rocks, seems unrelated to its neighboring color. ------And this is exactly right. There is little relation between rocks beside, under, or over its neighbors. Most of the rocks are immigrants -- island chains and pieces of sundered continents brought from afar and stuck together randomly along the western margin of North America. They comprise a terrane tale, as told for the San Juan Islands. ------Here, as along the Washington coast to the south, the continental margin 200 million years ago was inland, far to the east of today's coast, perhaps near present-day Calgary. All was peaceful along the coast since it was far from the Pacific Ring of Fire. Limes, shales, and sands collected along the quiet continental shoreline. Then, mayhem! ------The first collision was with a combination of two major terranes (Stikinia and Quesnellia) and many minor terranes. These are lumped into the Intermontane Superterrane for easier discussion. The impact occurred 181 million years ago. 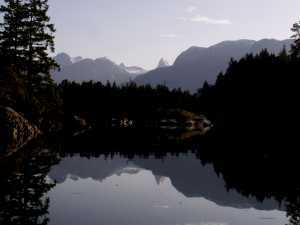 The terranes continued to shove against each other for another 30 million years, building the Canadian Rockies. The margins crumpled, riding over and under each other. In some areas, rocks 15 miles thick were shoved onto the western edge of the continent. The heat of compression baked and altered rocks. Where the Intermontane Superterrane docked (smashed!) against the continent, the suture zone was highly deformed. The light blue to the right is the original North American continent. Everything to the right of the light grey m (along the BC - Alaska border) is the Intermontane Superterrane. ------A second collision began about 100 million years ago as two more terranes, the Wrangellia and Alexandria terranes (referred to as the Insular Superterane) collided with the outer margin of the Stikinia terrane of the Intermontane Superterrane. This collision is marked by a wide zone of volcanic activity. Huge masses of molten magma intruded the crust along the collision zone. These magmas fed the surface volvanoes. The bulbous intrusions slowly cooled creating an almost continuous mass of granitic rock along the continental margin. Geologists call such huge masses of once-molten rock, cooling deep in the crust, batholiths (bathos -- deep. lith -- rock). Erosion has stripped off the surface volcanoes. Today the granite of the Coast Range Batholith makes up one of the largest areas of batholithic intrusion on the continent. This map shows the Insular Superterrane -- the brown and green on the geologic map. 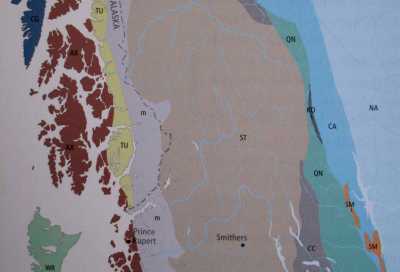 The suture zone where this Terrane lodged against the western margin of the continent is noted by the light grey m on the map. ------Beginning about 85 million years ago, the sea floor plate carrying the terranes against the continent split in two. The northern section, the Kula Plate, slid to the northeast against the westward moving North American continent, from Baja California to the Aleutian Islands. The boundary of these plates was thus torn laterally along northwest-trending shear zones. Lateral motion, referred to as strike-slip faults, moved some westerly segments of the Kula plate as much as 400 miles northerly relative to the mainland Rocky Mountains. 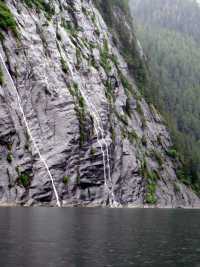 The northwesterly passages and mountain ranges along the cruising routes of British Columbia follow the fractures of the Fairweather and Queen Charlotte Faults. 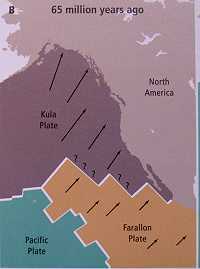 The southerly section, the Farallon Plate, moved more directly to the east against Central America and Mexico. ------About 55 million years ago the Kula plate began an even more northerly motion. Riding on the Kula Plate was the Pacific Rim Terrane (consisting of volcanic and sedimentary rocks). 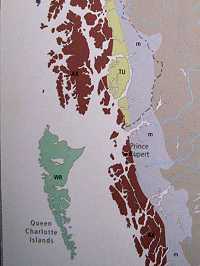 It was scraped off and plastered against the continental margin, forming what is today Vancouver Island. ------Another terrane, farther west than the Pacific Rim Terrane but also riding northeasterly on the Kula Plate, was the Crescent Terrane. This terrane was composed mostly of volcanic rocks and just before 40 million years ago lodged against the western margin of the Pacific Rim Terrane. 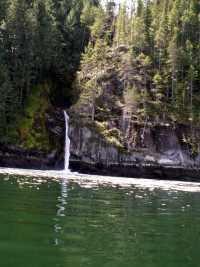 It composes the coastal margin of southern Vancouver Island. 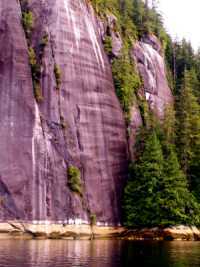 ------The joining of the Crescent Terrane did not cause much metamorphism in British Columbia, but the force of compression folded and thrust-faulted the sedimentary rocks along the Straits of Georgia. 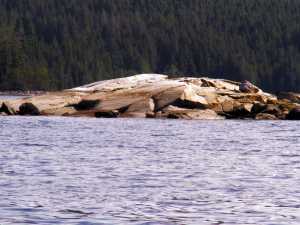 This rock wrinkling created the Gulf Islands. The grey area on the right side of the map is the smashed interterrane contact zone. The light green comprising most of Vancouver Island is the Pacific Rim Terrane. 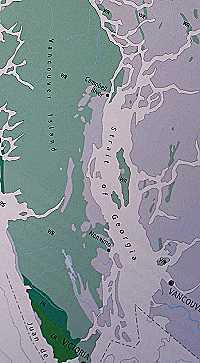 The darker green of southwest Vancouver is primarily Crescent Terrane. ------By 40 million years ago, the Kula Plate subducted under the westerly moving North American Plate and its compressional force ceased. (Kula means 'all gone' in the coastal native language). With the Kula digested, the northwesterly moving Pacific Plate was in contact with North America from the Straits of Juan de Fuca north to the Aleutian Island Chain. 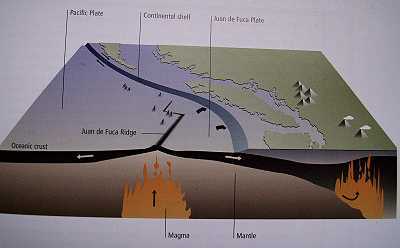 ------A remnant of the Farallon Plate, the Juan de Fuca Plate, continues to subduct under the North American margin from the Canadian border southward under Washington and Oregon creating the volcanism of Mt. St. Helens and the Coast Range. This subduction also generates earthquakes under the Pacific Northwest. ------With the end of headon plate collision about 40 million years ago, the margin of the continent relaxed and stretched. 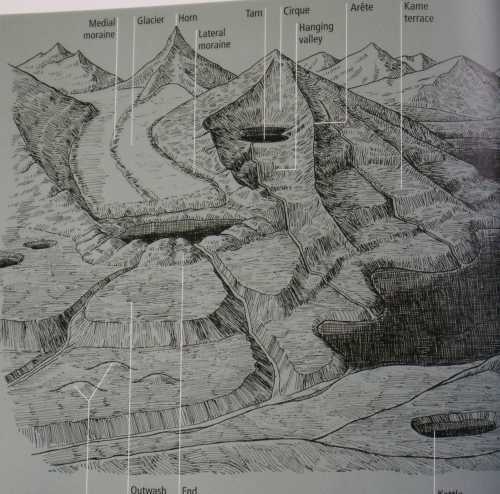 The subducting plate deep under the continent was melting, and molten material was forced upward by deep heat and pressure. About 17 million years ago, the surface crust cracked creating vast areas of black lava (basalt) extrusion over the surface of the land now disected by the Columbia River. ------About 6 million years ago, the subducting plate steepened its descent (perhaps due to an acceleration of the movement of the American Plate) and volcanic activity became intense. Thus the Cascade volcanoes. ----- This heating beneath the Coast Range Batholith, geologists have calculated, caused enough thermal expansion to lift the batholithic granites of the coast range by as much as a mile -- and they continue to rise today. 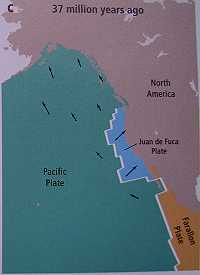 ------The subduction of the Juan de Fuca plate and lateral motion along the offshore Pacific Plate continue to rub along the plate boundaries creating earthquakes in the Northwest. The largest shock recorded in Canada, 8.1 on the Richter scale, occurred off the northwest coast of the Queen Charlotte Islands in 1949. 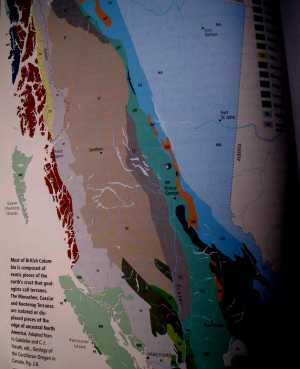 Recent studies have indicated a locking of the shear zones off the BC coast. The potential for a Big One is greater than ever. ----- However, as Robert Frost would say, the story isn't over with fire -- there is also ice. And, to make marvelous scenery, a combination of both puts the right tools in the master sculpter's hands. ------For millions of years, the heat under crust along the passage north has been expanding and swelling the land above lifting the granite mountains high enough to capture winter snow. The onset of the Great Ice Age accelerated the effect of ice. ----- Glaciation began about two million years ago. The Ice Age was not a time of continuous cold, but of alternating periods of cold and warm. Periods of interglacial warming last about 20,000 to 60,000 years, and during the warmer periods there are variations in global temperature that cause minor advances and retreats. ----- During the past 800,000 years there have been perhaps twelve cycles of glacial advance/retreat. The last period of cold began about 25-30,000 years ago and reached a maximum about 14,000 years ago. That advance ended only 10,000 to 13,000 years ago, depending upon latitude and elevation. ------There was a minor period of increased cooling (the Little Ice Age) that ended in the late 1800's. During the 1900's, North America has lost about a third of the mountain ice, and the trend is accelerating during the current period of global warming. ----- The Ice Age is best known for the great sheets of ice, the Continental Glaciers, that crunched southerly from Canada and buried the northern portions of North America. Like crystalline conveyor belts, the Continental Glaciers hauled Canadian gravel to the glacial terminus, and dumped the residue into the heaps that created Long Island and Cape Cod. ----- But the Great Cooling also chilled the climate of the entire continent. 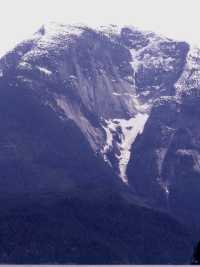 High, cold mountains were inundated with snow; especially those mountains along the coastal regions with abundant precipitation. 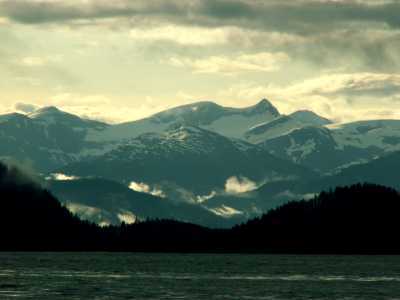 The Coast Ranges of British Columbia and Alaska were soon buried in snow, and alpine glaciers began to form. ----- Water, liquid or frozen, is the enemy of land. Any crustal fragment above sea level is constantly attacked by water until the land is ultimately reduced below sea level. If it were not for the heat of the earth's interior, there would be no land above the sea. Subcrustal white-hot convection cells lift crustal blocks, slide them into collisions, and heave them around like marshmallows in a boiling pot of cocoa. These uplifted hunks are soon worn down by water and, without continued internal uplifting forces, would soon be reduced below sea level. Earth would truly be the blue planet and all animals would be best adapted with gills. ----- Sure, wind does some work, but its major effect is in conjunction with water, such as ocean waves and ice storms. Sandstorms can scour, frost windows, and polish rock, but for honest, hard, destroy-the-land work, water is ultimate leveler. ----- One can quickly learn to see the artistry of ice on mountains, but the associated names of glacial features take a bit more time to absorb. For those who wish, tilt back and enjoy the artistic result - and for the others, we'll supply some names. ----- Ice needs a place to grow - an incubator. Snow alone is too light to be much of a threat to solid rock. But piles of snow heaping high on a mountain to such depths that summer heat is unable to melt off each winters accumulation results in a mound of compressing whiteness. The snow at the bottom of the heap is subjected to the weight and pressure of the overlying mass and slowly compresses into ice - solid, hard, crystalline ice. Ice's density can challenge that of rock, as the Titanic can attest. 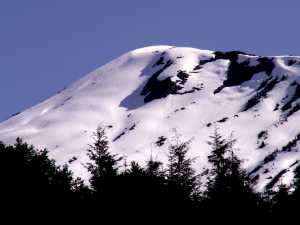 ----- The mound on the high mountain starts to flow downhill under the gravitational pull on the mass. As it does so, it carves the underlying rock forming a bowl. Perfect! The bowl traps and holds more snow, that makes more ice, until the spoon-shaped bowl spills ice downslope. Thus are cirques formed. 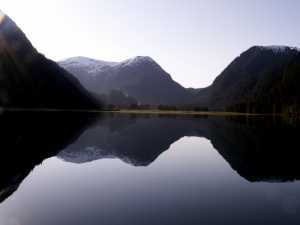 ----- A mountain highland may be attacked by the headward gnawing of several glacial cirques. The result is a sharp horn of rock. 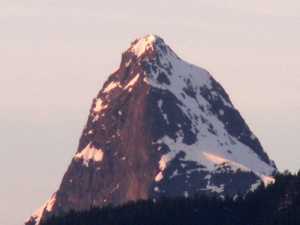 The Matterhorn is the classic example, but many horns can be seen in British Columbia that rival the stark beauty of the Alps. ----- Ice and water erode in very different ways. Water carves downward with most of its cutting power concentrated in the stream or river, and relatively little along its flanks. The resulting valley is V-shaped. Ice, in contrast, carves the flanks of a valley almost as effectively as the base creating a U-shaped valley. With a quick glance, you can differentiate the relative effect of water and/or ice in carving a mountain valley. ----- When rivers join, the streams usually join "at grade," meaning the joining waters are at the same elevation. Rivers 'eat' their way headward, radiating their tributaries headward from the mainstream. Thus there are no waterfalls at the junction of stream-carved valleys, since headward erosion begins at the junction. Glaciers, however, do not join at grade. Ice from a tributary valley can join the main glacial valley at any elevation since the new ice flows directly into the main glacier. There is no exceptional erosive carving at the juncture as there would be with liquid water where the gradient is steeper. Thus, when the ice melts, the two valleys, not at grade, now have streams and the tributary stream in the 'hanging valley' leaps in impressive waterfalls down to the main valley. 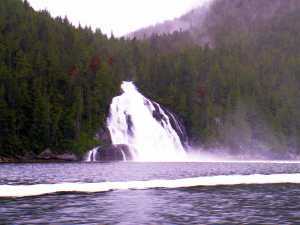 The cruising routes in British Columbia are festooned with waterfalls. -The artistry of ice is also reflected in subtle ways. 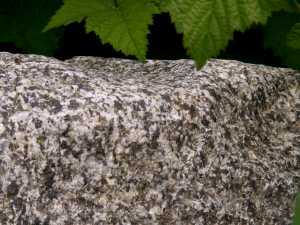 The granites of the Coast Range Batholith can be polished, scratched and grooved by the passage of ice. ----- -There are even more subtle traces of Ice Age left behind as clues for the curious. In Squirrel Cove, at the head of the ramp, there's a muddy road cut - hardly deserving a second glance. See those narrow wavy lines in the picture below? 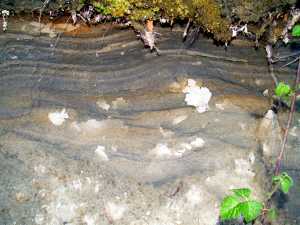 They are thin alternating beds of light and dark shale. 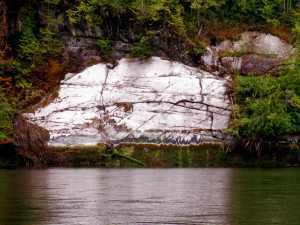 Each was seasonally deposited -- white in summer, when there is plenty of oxygen in lake water; dark in winter when there is little oxygen and organic material can't rot so the carbon stays in the mud. Yep! A glacial lake with seasonal 'varves' (alternating light/dark layers). 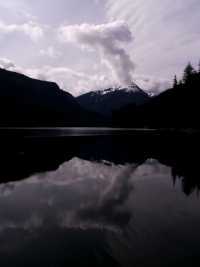 A record of an Ice Age lake along coastal British Columbia. Betcha there were plenty of natives living along the shorelines.